At the edge of risk… on the other side of reason! Screen legend Jack Nicholson (The Shining, Prizzi’s Honor, Chinatown) stars in this gripping story of a man torn between his career and his conscience. 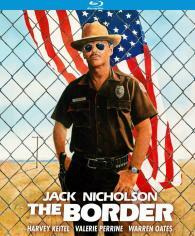 As a border guard involved in drug smuggling along the Rio Grande, Charlie Smith (Nicholson) has crossed the line many times. But when he decides to clean up his act and help unite an “illegal” woman with her baby, he runs afoul of his corrupt department, his greedy wife (Valerie Perrine, Superman: The Movie) and a ruthless neighbor (Harvey Keitel, Blue Collar) in this action-packed suspense-thriller. Veteran filmmaker Tony Richardson (Tom Jones, The Hotel New Hampshire) directed this tension-filled crime-drama co-starring the great Warren Oates (The Brink’s Job).